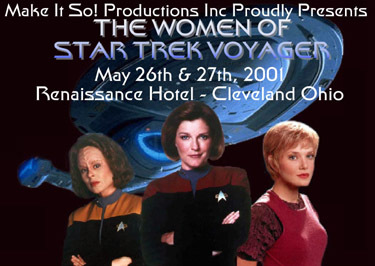 Click here to read LadyChakotay's report on the Women of Star Trek Voyager Convention. 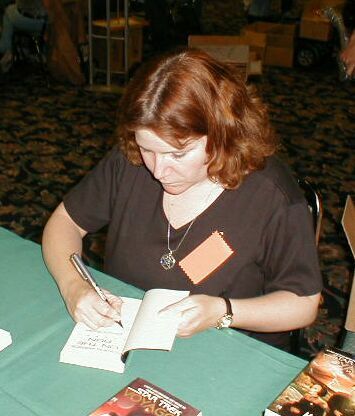 This is author Christie Golden autographing one of her novels for me at a convention in Denver, Colorado this past April. I wasn't able to attend, but my dear friend, Survak, was kind enough to have her personalize a book for me. Christie is a J/Cer at heart, and her wonderful novels definitely testify to that. If you haven't read them, you're missing out! Christie writes original fiction as well as Star Trek. Her Voyager novels include: The Murdered Sun, Marooned, Seven of Nine, and most recently The Dark Matters Trilogy. Please do not reproduce or post any of these images without my authorization. Image of Christie Golden courtesy of Survak.